Effective June 24, 2018, we implemented major service changes including two route realignments, increased service hours on select routes and a revised fare payment option. 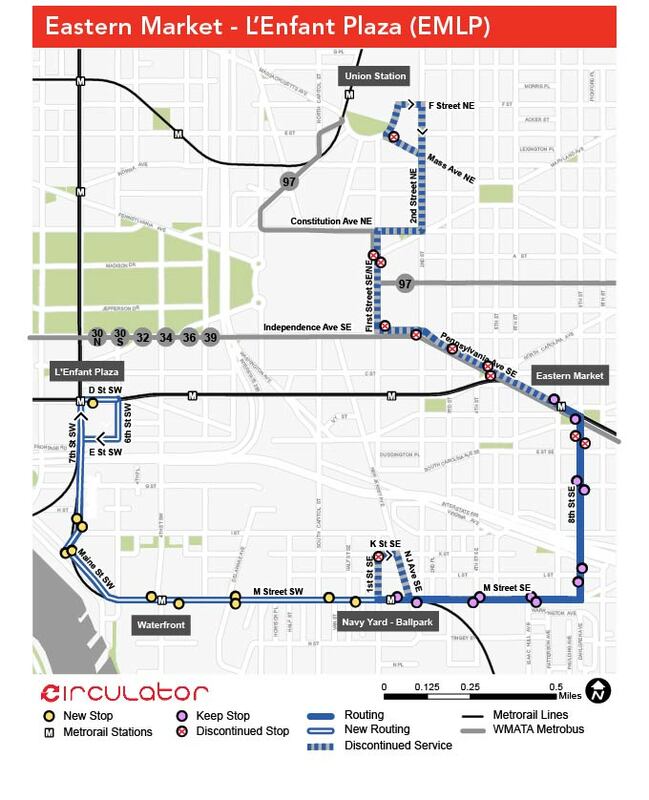 Effective March 18, 2019, we implemented a new fare payment policy making all DC Circulator rides free indefinitely. Service changes included reconfiguration of the current Union Station-Navy Yard (US-NY) and Potomac Avenue – Skyland via Barracks Row routes (PS), adding permanent late-night service between McPherson Square and Union Station, and discontinuing the DC Circulator-exclusive paper fare passes. The route realignments created new one-seat connections currently unavailable by Metrorail or Metrobus. Additionally, these changes better align DDOT’s resources with growing activity centers such as Congress Heights and Southwest Waterfront, and improve the reliability of DC Circulator service. Metrobus now provides additional Route 92 service for riders along Good Hope Road and additional U8/W4 service along Alabama Avenue from Congress Heights to Skyland Town Center. The NEW Eastern Market – L’Enfant Plaza and the NEW Congress Heights – Union Station routes runs weekdays from 6 am – 9 pm and weekends 7 am – 9 pm. Eliminated winter vs summer hours schedule variants on the former US-NY route and PS Route. The Georgetown – Union Station route continues year-round late-night service between McPherson Square and Union Station from 9 pm to 3 am on Fridays and Saturdays. 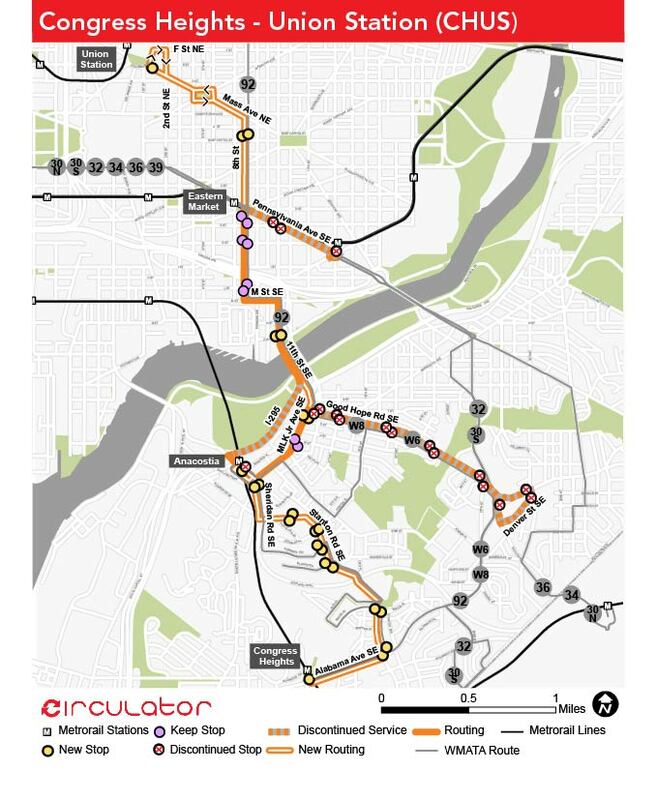 The DC Circulator-exclusive paper bus passes are now discontinued. All rides are free, and customers are no longer required to pay $1 per trip. Before the DC Circulator implemented these changes, the team followed an extensive public involvement plan. The public was invited to comment online and in public between December 15, 2017 to February 16, 2018. DDOT hosted a public hearing on Barracks Row on January 4, 2018 and an open house at the Anacostia Library on January 31, 2018. DDOT also visited and met with affected Advisory Neighborhood Commissions. The major service changes to Potomac Avenue Metro – Skyland and Union Station – Navy Yard Metro were part of the recommendations as a result of the 2017 Transit Development Plan (TDP) Update planning process.